Rochalia Residences in Hang Dong. Singapore based Kingsfield Asia Consultants Group has recently outlined plans to make a splash in the Chiang Mai property scene with 2 new residential developments worth a combined 1.1 billion baht. The 2 projects, which will be developed as joint ventures with local partners, are the 800 million baht Rochalia Residences in Hang Dong district and the 300-million-baht [email protected] near Chiang Mai University. Increasing demand for property in Chiang Mai from Chinese buyers was the main reason cited by Kingsfield for making their move in the northern Thai city. “We see an increase of Chinese investors buying up lots of properties in bulk for a second holiday home or investment in Chiang Mai,” Kloe Long, the CEO of Kingsfield said in a recent interview in the Bangkok Post. “Condo prices in Chiang Mai are 40% lower than those in Bangkok. Many see greater potential for capital gains in the next 3-5 years after the Asean Economic Community opens in 2015,” Ms Long added. The Kingsfield chief stated that Chinese investors are also buying up hotels in Chiang Mai due to the increase in Chinese tourists after the Lost in Thailand film was a big hit in that country. New, regular direct flights to Chiang Mai from Beijing and Guangzhou, which are slated to begin this month and December 1 respectively, are also another reason that the city is becoming more attractive to investors from China, who are increasingly looking for more comfortable and affordable housing abroad. 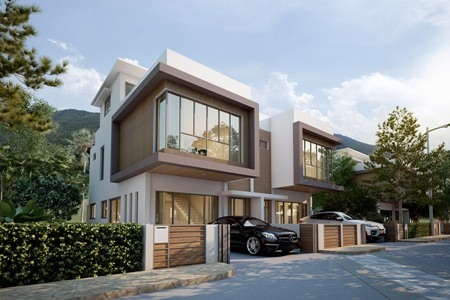 Early designs of Rochalia Residences in Hang Dong suggest the development will offer luxury Sky Villas in a 2 phase project with prices ranging from 4-7 million baht, while [email protected] will comprise of condominium style units in low-rise 8-storey buildings and will target the more budget conscious buyers with prices ranging from 1-3 million baht. Both projects are expected to be officially launched in the coming months. Award-winning AKARYN Hospitality Management Services (AHMS) is gearing up to expand its hip akyra brand in the heart of Chiang Mai’s most buzz-worthy boulevard, Nimmanhaemin, in the third quarter of next year with the launch of akyra Manor Chiang Mai. Akaryn Hospitality Management Services (AHMS) Managing Director and Aleenta Resorts Founder, Anchalika Kijkanakorn. Boutique hotel pioneer AHMS has partnered with Singapore’s renowned Manor Design Studio to bring an innovative and thoughtful approach to the first expansion of the akyra brand, successfully created almost two years ago at the akyra Chura Samui on the white sands of Chaweng Beach. AHMS founder and owner Anchalika Kijkanakorn, also the Chairman of Small Luxury Hotels of the World (SLH), said she was thrilled to be creating a hotel with Manor Design Studio, and looked forward to developing the creative partnership AHMS had forged with the Singaporean design mavericks. Chaw Chih Wen, Manor Studio’s Design Director and creative driving force, is the acknowledged master of creating living spaces as blank canvases that invite interaction from their inhabitants, and has been widely awarded for his work. The former protégé of Cesar Pelli Architects in New York has had his work selected for exhibitions such as La Triennale di Milano (2007), the 6th International Conference in Tokyo, Japan (2006), and Tokyo Designers Week (2010). He is also the 2012 A’Design Award winner for Interior Space and Exhibition Design. Ms Kijkanakorn said the resort will be ‘modern, warm, welcoming and stylish’, located in Soi 9 Nimmanhaemin Road, one of the most hip streets in Chiang Mai. “Its restaurant will be the place to be seen in downtown Chiang Mai, with a state-of-the-art show kitchen and an amazing line-up of cuisine,” she said. “We’ll have a small executive meeting room catering for high end meetings and more. The hotel will also have Thailand’s first organic rooftop nursery (think NYC rooftop gardens) and a SLOW Food concept, which means we grow most of our own ingredients. The partnership between AHMS and Manor Design Studio follows the recent announcement that AHMS is to open the AKARYN Koh Krabeay Retreat & Spa on its own island in Cambodia in 2015, with sustainability and environmental preservation its watchwords and featuring 40 exquisite and very spacious pool villas and a destination holistic and medical spa. Ms Kijkanakorn said akyra Manor Chiang Mai was a passion project from the heart, as the northern capital was one of her most loved getaways. akyra Manor Chiang Mai will feature 29 suites and residences over seven floors, less than a kilometre from the town’s main tourist area, with a striking pool as an oasis in the centre of Chiang Mai. “Soi 9 is known as ‘coffee street’ and is popular with locals and visitors and is a draw for Thai tourists at weekends,” Kijkanakorn said. “akyra will be a 300m walk from the junction of Huay Kaew Road and 500 metres from Suthep Road. “In terms of target market, we are looking at savvy corporate travellers and friends and families from Thailand and around the world who appreciate a hotel with a difference. It’s about bringing a bit of Bangkok ‘wow’ and cutting-edge Singaporean design flair to the ‘Rose of the North’ while respecting her traditions. Ms Kijkanakorn said the hotel would also be an active patron of the arts, building on the connections and creativity of Manor Studio and Chaw Chih Wen, with the lobby and guest rooms functioning as a ‘living gallery’, with works also available for purchase by guests. Founded in 2003, the award-winning hotel group currently operates four resorts in Thailand - two in Koh Samui and one each in Phuket and Hua Hin. All are boutique in size and located on secret beach locations, and offer more than resorts but authentic destination experiences. Through its Pure Blue Foundation, each of the collection’s resorts works in marine conservation and community action projects to benefit their destinations, from saving endangered marine turtles in Phang Nga to aiding regeneration of reefs and organic farming, and most importantly, educating the next generation on the fragility of ecosystems and how to help preserve them. Kijkanakorn said Manor Design Studio also valued giving back to the community, and in Chiang Mai, the efforts of the Pure Blue Foundation would focus on the training of impoverished migrants in skills that would help them secure employment. “Manor Group and AHMS have plans to join forces to work together to expand our collection of design hotels with good causes in Thailand and neighbouring countries. akyra Manor Chiang Mai is the first in this series,” she said. Parano Condo is being launched by Siripanna and completion is expected by June 2015. With the success of Siripanna Villa Resort & Spa, Chiang Mai, the award-winning resort in town, Supamit Kitjapipat, owner and Managing Director of the company, is now launching the newest project; the Parano Condo @ Chiang Mai. Condos are now available for pre-sale with special prizes available for those who reserve early. Parano Condo @ Chiang Mai is conveniently located on Mahidol Road opposite the new Promenada Resort Mall. It has the design theme of “real happiness is living in harmony and comfort.” The 8-storey condominium will be built on a 1-rai plot of land with lush gardens, fitness centre and one of Chiang Mai’s biggest rooftop pools offering a spectacular panoramic view of the city. Just 15 minutes from Chiang Mai International Airport, Parano Condo @ Chiang Mai offers easy access to the city centre, the up-and-coming new international airport and high speed train. The area is also well served by public facilities, shopping malls, a hospital and golf-course. Construction will begin in April 2014, with expected completion in June 2015. 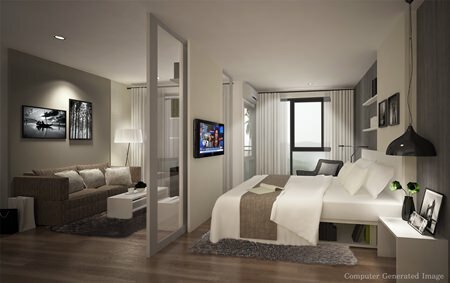 Parano Condo @ Chiang Mai units are competitively priced, staring at 1.1 million baht. All buyers who reserve by January 31, 2014 will have a chance to win a trendy Suzuki Swift eco-car, valued at over 400,000 baht. To view the show unit or learn more, contract the sales office at 053-240-666 or 084-608-3666, or email: [email protected], www.paranocondo.com.